If you are a gamer, you’ve probably noticed that you have a tendency to be attracted to the latest and greatest. Shiny new technology is like catnip to a gamer, and we generally love it when our games have crystal clear graphics, killer sound, and really push our systems to the limit. Believe me, I totally get it. All the same, sometimes a game just needs to satisfy a particular urge, and that urge can be so unbelievable simple, all of our burning need for the complex and innovative goes right out the window. That’s essentially what Flood-It 2 is like for me. The game is about as ridiculously basic as you can get. 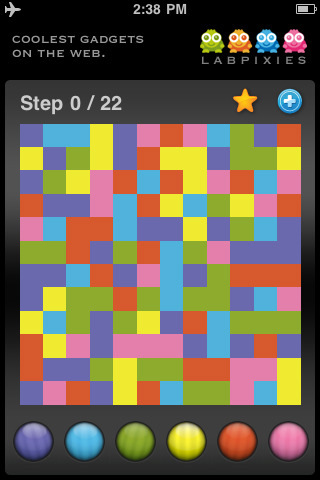 You start off with a grid of colored squares and matching colored buttons at the bottom. Starting at the top left corner, you use the buttons to “flood” that area with color. When you change the color, every adjacent square with the same color also changes, increasing your colorable area every time. Do it in a certain number of moves and you flood the board. It’s a stupidly simple concept, but I can’t stop playing it: I gotta flood the board! You can choose the size of your board, and there are a number of different color palettes you can use, including one specifically designed with the color-blind in mind. There are also some lovely chiming sounds that accompany each color change; very minor, but it really adds to the overall appeal of the game, as each move becomes an audio and visual treat. It’s not a very involved game, so there aren’t a whole lot of special features, but there are a couple of extra challenges you can take on once you get bored with the basic game, like a timed version or trying to end the board on a specific color. Honestly though, the basic game is tremendously addicting, even on par with some of the fancier PopCap games. Flood-It 2 is easy to pick up, hard to put down, and has infinite replay value. Plus, for the price, you’d be hard pressed to find anything better. AppSafari review of Flood-It 2 was written by Tracy Yonemoto on April 1st, 2010 and categorized under App Store, Free, Fun, Games, Puzzler. Page viewed 3853 times, 1 so far today. Need help on using these apps? Please read the Help Page.